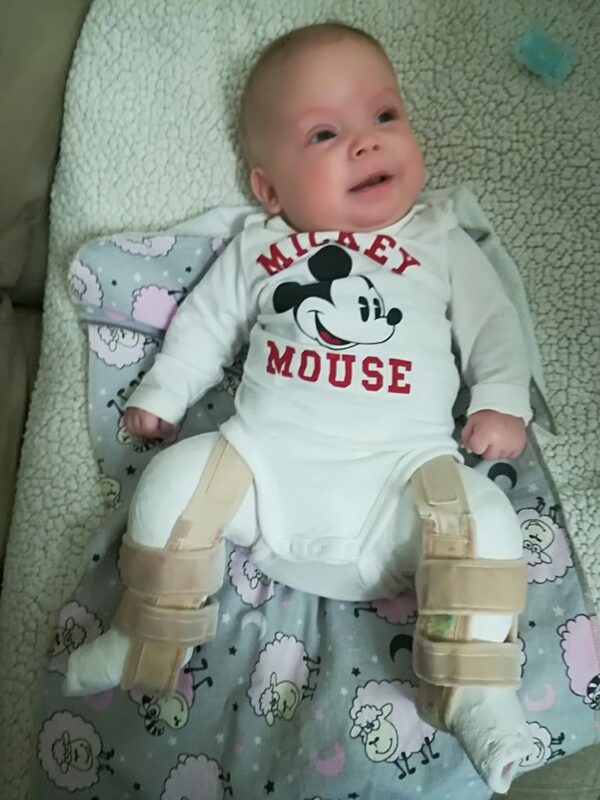 Hello everyone, my name is Michalka, and I would like to ask for your help to be able to stand on my feet and take my first steps. It hasn’t been long since I came into this world, nearly one year, but my suffering began in my mum´s belly. The doctors told her that I would be born with a cleft spine and hydrocephalus (a large head) and that’s why they decided to perform a caesarean section in the 33rd week of pregnancy. Nobody knew what the result would be. But I knew my loving family awaited me, so I decided to be brave. It became apparent that this bravery would be necessary, as I was born with a club-foot – my left foot was turned to one side. I would have a lot of operations in front of me. The first operation took place when I was only four days old. The doctors closed the open vertebrae and repositioned the damaged spinal nerves. After one week a further long operation took place. My cerebrospinal fluid began to accumulate in my brain, which was causing my head to grow. The doctors inserted a tube from my head to my stomach to remove the surplus fluid. This was a complicated operation, but I survived it, and after some time I was finally able to go home with my mum. During the next few months we attended hospital appointments on a weekly basis for check-ups of my head. We also started rehabilitation on my feet, which were in a very bad state. My calves were very week, my feet paralyzed and I was also trying to cope with my club-foot. The foot was straightened into the right position and fixed in a plaster cast. For a couple of weeks, I was a little baby in a plaster cast from my toes to my chin. In the very beginning everything went well, but the last two plaster casts went wrong. I had an unnaturally curved leg and a heel turned inside the foot. The doctors had run out of ideas and told my parents that they could help no further. They said we should come to terms with the fact that I would never walk. However, my family did not want to give up. My grandma found an expert at the orthopaedic clinic in Vienna who could help me. We were grateful for this ray of hope, even though an operation in Vienna would not be paid for by any insurance company. My parents had to raise a lot of money for my first operation. They succeeded, and we were ecstatic that I would be able to go to Vienna for seven weeks. The operation was successful – my legs were able to “turn” a little. This was a great joy for all of us. I wish this could have been my last surgery, but unfortunately not. For my legs to recover completely I will have to go to Vienna several times. I will also need regular rehabilitation in the special rehabilitation centre after my surgeries and I cannot do it without the necessary medical equipment. I am used to pain and being in plaster casts, and I also know I will have to wear a splint for a few years, but I am fine with that. I just want to be able to stand on my legs without any help and start walking, so I will bear the pain. There is still a long journey in front of me. For the necessary operations in Vienna, rehabilitation and medical equipment I will need 2 147 368 CZK (around 83 000 EUR) over the next two years. Our family lives very modestly, and all the money we have has been used for my treatment. 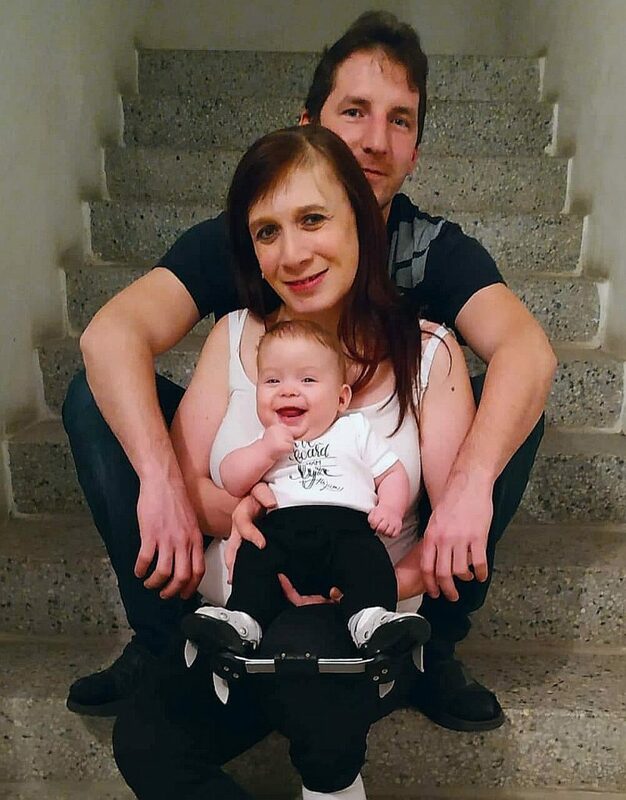 That´s why my parents Michaela and Zdeněk decided to organize a collection of money, in cooperation with Život dětem o.p.s., for my operations in Vienna, rehabilitation and necessary medical equipment. We would like to ask all of you for help. We would be grateful for any contribution which will help me to stand on my feet and start walking. Please give any amount you can to the publicly visible fundraising account on the website, account number 1117771700/5500, variable symbol 1919, and in the note write Michalka. Thank you for your help and the hope you give me for my recovery and to take my first steps. With love and heartfelt thanks, Michalka and my parents. All donations to the fundraiser are tax-deductible. A donation certificate for tax deduction, after filling out this form, will be sent to you by Life for Children. The fundraiser is organized by Life for Children, in accordance with the law.